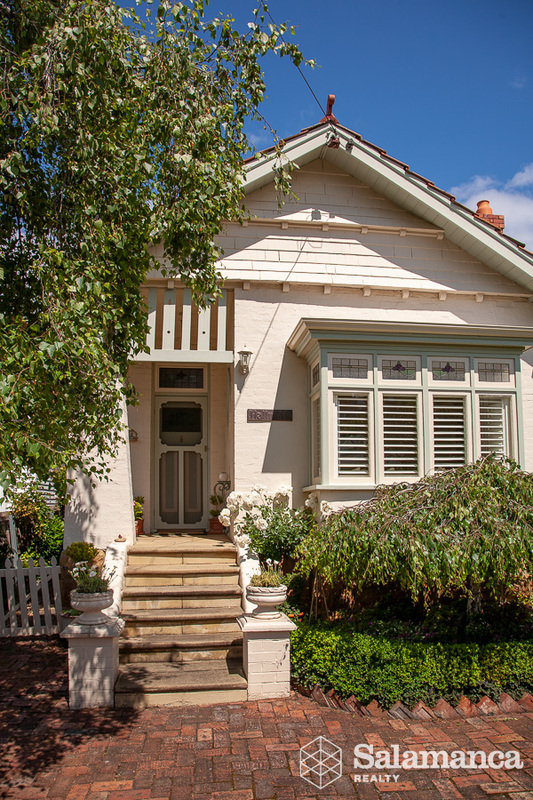 This lovely immaculately presented and maintained period home, c1920, has gorgeous street appeal and style and is positioned in one of West Hobart’s most desirable streets and locations. The elegant modern interior blends seamlessly with the superb period features which include gorgeous, 11-foot, pressed tin ceilings, picture railings and mantels, ornate fire surrounds and leadlight bookcase, hallway entrance fret work, lovely stained-glass feature windows, bay window and polished Tas oak flooring. On entry into the wide, light and spacious hallway, the style and elegance of this lovely home is enhanced by the neutral, calming colour scheme throughout and the classic highlighted period features. The level floor plan comprises of three spacious rooms to the right of the hallway, two of which are double bedrooms with built in robes and the third room is currently utilized as a sitting room, however, this could easily be a third double bedroom, if required. There is also a conveniently located, light filled, renovated bathroom with large skylight, walk in shower and WC and a hide away laundry, with ample storage, off the hallway. At the rear of the home is a lovely light and spacious open plan living, dining and kitchen area with access through large double doors to a delightful, private flagstone courtyard, ideal for entertaining. The recently renovated, modern kitchen is a cook’s delight with quality appliances, ample bench top for food preparation, an abundance of soft closing drawers and cupboards and includes a large pantry cupboard. There is convenient rear access to under cover, secure parking via remote control door from the Pitt Street entrance. In addition, a spacious storage cupboard and second WC with sink is included in this semi enclosed garage area. There is also level entry to the house from this rear access. The surrounding, level award-winning gardens will delight any green thumb and there is not a lawn to be mowed! Only a short stroll to popular Providence Caf and minutes’ walk to North Hobart’s restaurant, entertainment and retail precinct, the State Cinema, Hill Street Grocer, doctors’ surgeries and walking distance to the CBD. Rarely do properties of this high calibre in such a fabulous, highly sought-after location, come onto the market. Don’t delay. * THE VENDOR RESERVES THE RIGHT TO ACCEPT AN OFFER PRIOR TO THE CLOSING DATE.